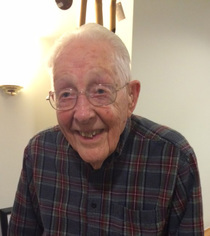 Delven Devore passed away peacefully on April 7, 2019, at Westwood Place at 99 years of age. He was born at the beginning of the Roaring 1920’s in a log house at the end of a county road between SR 26 and the Little Muskingum River. That house is now the last house on the road and is still standing. Dr. R. H. Latta rode a horse to the house for the delivery, and also delivered another baby, Ethel Foraker Sloan the same day. He was the only child of Forrest Devore and Rosa Devore and lived there until a new house was built on SR 26 and the family moved in 1926. He attended a two-room elementary school in Graysville and four years in the new high school built nearby. He played basketball and baseball setting several records in basketball. At 6 ft, he was a formidable basketball player and he was famous for his one-handed set shot. Delven scored 50 points in one game on the floor of the Woodsfield High School gymnasium, a floor record that was never eclipsed. During his senior year, he helped his team win the County Basketball Tournament by winning 26 games in a row. He also met his future wife Ethel Poulton who came from just down Route 26 in high school. He next attended Ohio University graduating with a BS in Ed. The year before graduation he married Ethel, and they were married 67 years until her passing. Ethel was the daughter of Fred and Pearl Poulton, and her parents were co-owners of the general store which served the area. The Poultons had purchased the general store from the Bode brothers in 1918, and with Fred’s brother lived in adjoining twin houses. Delven and Ethel became the proud parents of three sons, David and Richard who are living in northern Ohio, and a third son living near Washington. One grandson lives in southern California and one granddaughter in South Carolina. Delven taught one year at Hannibal H.S., and one year at Woodsfield H.S. coaching and explaining science. Then he entered service in World War II, and his background in science landed him in the hospital corps. After his discharge he spent a year in the oil production field with his uncle. He was asked to be principal of Clarington H.S. where he served four years. He completed his MEd from Ohio University at the age of 30 and became superintendent of Woodsfield village schools and after consolidation then superintendent of the county schools, retiring in 1978. Delven was a member of the Woodsfield U.M. Church where he held various offices, taught Sunday School for some sixty years, sang in church choir, was president of Kiwanis, the library board, the CIC, and the Veterans Service Commission. He was a 70-year member of the American Legion, a member of Clarington Lodge 597, Woodsfield Eastern Star #268, and the county Farm Bureau. He supervised the building of two schools, Woodsfield Elementary and Swiss Hills along with additions to three schools, and introduced kindergarten, driver education, football, and vocational ed to the district. He was an avid outdoors person with hunting and fishing, camping, travel, and hiking leading the list. His favorite sport was fishing and he made a number of prize catches. He and his wife enjoyed traveling and visited England, Canada, Mexico, Barbados, and all the 50 states aside from Texas and New Mexico. A devoted family man interested in ancestry as well as living relations. Enjoyed antiques and both collecting and refinishing them. Lived a full life, and is already missed. Calling hours will be held 3-8 p.m. Saturday April 13, 2019 at the Bauer- Turner Funeral Home Woodsfield. Funeral Service 2 p.m. Sunday April 14, at the First United Methodist Church of Woodsfield officiated by Rev. David Cottrell. Burial will follow in the Oaklawn Cemetery in Woodsfield, Ohio with full Military Services. Eastern Star Lodge services will be held at 7:30 Saturday evening at the funeral home. Masonic Lodge services will be held prior to funeral service at church.